After Dario Franchitti collected career victory No. 30 on the streets of Toronto, he was 55 points ahead of Verizon Team Penske driver Will Power. Four races later, after a DNF by contact in New Hampshire and a few finishes behind Power, Franchitti was leading by only five points. 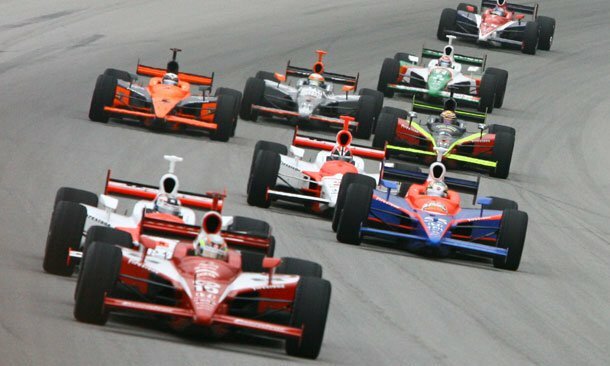 Power took the lead at Twin Ring Motegi when he finished second to Franchitti’s fifth. But Franchitti answered back in Kentucky with a second-place finish to Ed Carpenter, which — coupled with Power’s pit stop woes — was enough to reclaim the lead and his fourth series title in five seasons. What Franchitti said: “The ups and downs … the way the season ebbs and flows, I think one thing I’ve learned is to keep a very open mind. There’s not been a point in any of these championships where I thought, ‘Yeah, we’ve got this,’ or on the other side where, ‘We’re out of this thing.’ I’ve just kept an open mind and tried to each week, each moment in the car just get the most you can, make that next pass, make that next move. Franchitti didn’t win his first series championship until 2007. Now, three years later, he is a three-time title winner at age 37 and is certainly not showing any signs of slowing down. By looking at the cumulative of the success he has enjoyed since 2007, Franchitti acknowledges he is amazed. Even when he was 59 points behind Power with four races remaining, Franchitti remained confident that he could contend for the championship. The impact of those results didn’t fully hit Franchitti until the off-season when he had a chance to reflect on his accomplishments. What Franchitti said: “It’s very difficult to kind of compare the three. That’s like asking to compare the two Indianapolis 500 wins. I do believe the competition level in the series is going up. For whatever reason, we at Team Target, both Scott (Dixon), and myself, maybe didn’t have the speed advantage we had last year. In some cases we have to work harder to finish in the top five at races. The storyline: Who would have thought there wouldn’t be a yellow? The championship battle was heated throughout the season, with the lead in the standings being swapped 15 times over the 17 races. Dixon led entering the finale by five points over Franchitti, his Target Chip Ganassi Racing teammate, and by eight over Team Penske’s Briscoe. In the Firestone Indy 300, Dixon and Briscoe dueled at the front, both seeking to pick up the critical two bonus points for leading the most laps after Franchitti earned the one bonus point for starting from the pole. “It’s pretty much whoever beats who is going to walk away with the championship,” Dixon said before the race. What the contenders didn’t figure on was that the race would be caution-free for the first time in series history. No crashes, no debris. Not even a sandwich wrapper brought out a yellow flag. So, while Dixon and Briscoe were racing each other, Franchitti was on a fuel-conservation strategy. It proved effective when both Dixon and Briscoe had to pit for a splash of ethanol — their fourth stops of the day — in the final 10 laps. Franchitti coaxed the No. 10 Target Chip Ganassi Racing car to the finish line on three stops for fuel. For the plan to work, he needed everything to go right. It did. Franchitti won the race and title by 11 points over Dixon. With three races remaining, Dixon appeared to already have his name on the championship trophy. He had earned his long-awaited first Indianapolis 500 victory in May, and he had a 78-point lead over Castroneves in the standings after winning the Meijer Indy 300 on Aug. 9 at Kentucky Speedway. It was his third consecutive victory and record-tying sixth win of the season. But Castroneves and Team Penske never quit. Castroneves won the next race, the PEAK Antifreeze and Motor Oil Grand Prix of Sonoma County on Aug. 24 at Infineon Raceway, while Dixon finished 12th. That 78-point lead suddenly was sliced to 43. Castroneves then finished a controversial second a week later in the Detroit Indy Grand Prix. Race officials ordered him to surrender the lead to Justin Wilson late in the race for a blocking violation. Still, Castroneves whittled the gap to 30 points after Dixon finished fifth. Next was the season-ending PEAK Antifreeze and Motor Oil 300 at Chicagoland Speedway, the third consecutive year the season championship was coming down to 200 laps on the 1.5-mile oval. Dixon entered the finale needing to finish eighth or better to clinch. Castroneves didn’t help himself during qualifying when his four-lap run of 215.372 — good for fourth on the starting grid – was disqualified because he drove under the white line inside the track multiple times, a rules violation. Castroneves was forced to start 27th, while Dixon started second in his Target Chip Ganassi Racing entry. Castroneves charged to the lead by Lap 78 of the 200-lap race. Dixon had dropped to 10th in the middle section of the race, and the impossible started looking possible for Castroneves. But Dixon charged forward and regained the lead on Lap 186. Dixon and Castroneves were running 1-2, respectively, on the final restart of the race on Lap 194. Castroneves hung on Dixon’s rear wing at the white flag, as just .0102 of a second separated them entering the final lap. The cars were wheel-to-wheel, screaming down the frontstretch to the finish, with the checkered flag in the air. Castroneves won the race by 12 1/8 inches — a time margin of .0033 of a second — in a finish that needed a five-minute study of timing photographs to determine a winner. It was the second-closest finish in series history. But it wasn’t enough to wrest the title from Dixon, who earned his second championship by 17 points. Franchitti was in control after nine of 17 races, with three victories, including the Indianapolis 500. Franchitti held a 65-point lead — more than a one-race gap over Dixon — after winning the SunTrust Indy Challenge on June 30 at Richmond International Raceway. It appeared Franchitti was on cruise control for his first championship after 12 years at the top level of North American open-wheel racing. But Dixon had other ideas. He won four of the next seven races after Richmond. Dixon won the Motorola Indy 300 on Aug. 26 at Infineon Raceway to finally catch and replace Franchitti atop the standings, holding a four-point edge. Franchitti regained the top spot by three points by finishing sixth in the penultimate race of the season, the Detroit Indy Grand Prix on Sept. 2. Dixon finished eighth after spinning while battling for the lead late in the race and nearly taking out his championship rival while his stalled car blocked the track. The final chapter in this thrilling season was set for the PEAK Antifreeze Indy 300 at Chicagoland Speedway. Sixteen previous races featuring 2,733 laps of competition had come down to one 200-lap duel between Franchitti and Dixon. Franchitti won the pole in his Andretti Green Racing machine but lost the lead at the green flag. Meanwhile, Dixon had moved up after starting sixth and led 32 laps between Laps 135-190. Dixon lost the lead to his teammate, Dan Wheldon, on Lap 191 but regained it on Lap 194 when Wheldon slowed on the backstretch. Franchitti’s teammate, Danica Patrick, then spun entering pit road on the same lap, triggering the third and final caution period of the race. In a moment of nearly perfect drama, Dixon and Franchitti lined up one-two on the restart at the end of Lap 197 as the only cars on the lead lap. Franchitti, who had worked the entire race to save fuel, then moved to the high groove to size up Dixon on Lap 198 but could not pass. Dixon led Franchitti by .0600 of a second at the white flag and needed to stay out front for just 1.5 more miles to claim his second title. Then it happened in Turn 3 – one of the most unexpected moments in series history. Dixon’s car sputtered, running out of fuel. Franchitti roared past for the race victory and his first North American major series championship. Dixon coasted to the line in second, his Honda engine thirsting for just one half-gallon more of ethanol. The final margin was 13 points. What Franchitti said: “It was a pretty stressful time. We’d lost some points at Sonoma, and it was going to come down to whoever won the last race between Scott and I. It was Chicago, which was not one of my favorite tracks at the time. I had had some good results there, but I knew I had to win if I was to have a shot. It was all on the line. We were on the pole and the car was very fast, but I went off at the start of the race and the speed wasn’t there. The two Target cars and the two Penske cars passed me, and I knew I didn’t have the speed on my own to win the race. I had to use the one weapon I owned, and that was fuel-saving. All day, I saved fuel and I saved fuel. Castroneves led Team Penske teammate Hornish by one point in the standings after the penultimate race of the season, the Indy Grand Prix of Sonoma on Aug. 27 at Infineon Raceway. Target Chip Ganassi Racing teammates Wheldon and Dixon were third and fourth, respectively, at 422 and 420 points. That set up a four-man, two-team showdown for the championship in the season-ending PEAK Antifreeze 300 at Chicagoland Speedway. Hornish won the Indianapolis 500 in May, but two of his other three victories during the summer came on 1.5-mile ovals like Chicagoland, which was a good omen as he attempted to become the first driver to win three IndyCar Series championships. But Castroneves also had enjoyed success on 1.5-milers, winning at Twin Ring Motegi and Texas among his four wins entering the finale. So it appeared Team Penske was in good shape for its first IndyCar Series season title since joining the series full time in 2002. Wheldon, however, nearly stole the show in his first season with Ganassi after winning the title in 2005 with Andretti Green Racing. Wheldon dominated at Chicagoland, leading 166 of 200 laps to edge Dixon by .1897 of a second for the victory. Hornish repressed his instincts to duel with Wheldon and Dixon for victory – reminded on the radio by team owner Roger Penske of the championship math of only needing to finish third – and followed orders precisely, finishing third. Castroneves rallied from an early pit road speed limit penalty to finish fourth, as the title contenders occupied the top four spots in the race. But it wasn’t enough for Castroneves. Hornish and Wheldon finished the season tied at 475 points, but Hornish claimed his record third title on the tie-breaker of four victories to Wheldon’s two. Castroneves was third, an agonizing two points short at 473. Dixon was fourth at 460.